The coconut flour and the bit of coconut oil you use to fry up these babies won’t give you an overwhelming flavour of coconut – the coconut flavour is so mild that you probably wouldn’t notice it if you didn’t know. However, if you haven’t used it before, it absorbs liquid VERY quickly. So if you’re using it as a substitute, you’ll only need about 20% of the usual flour requirements and you’ll want to add about 20% more liquid (eg. eggs, milk) and good fats that help preserve the moisture (eg. coconut oil). The great thing about coconut flour is the fact that it is naturally gluten/grain free flour that is high in fibre and protein. 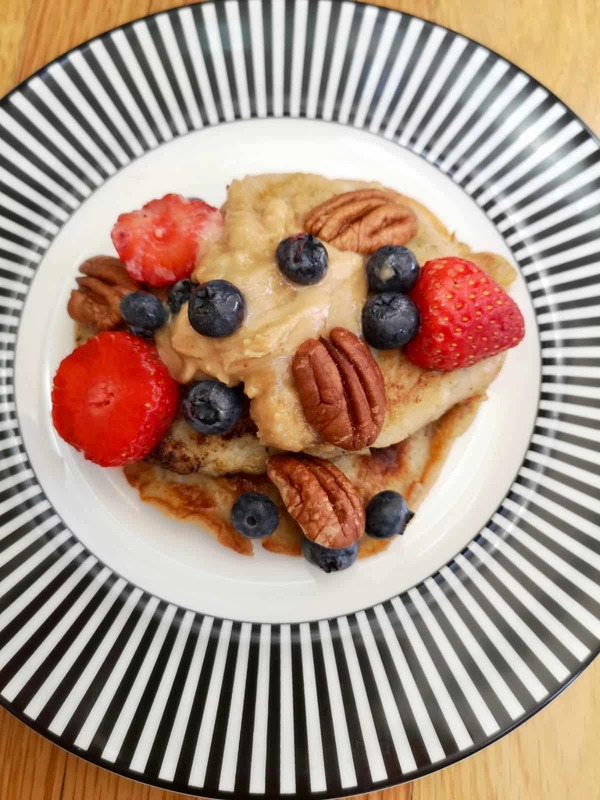 As a note – the banana in these pancakes isn’t just for flavour – although the banana definitely comes through. The mashed banana actually works with the egg and the coconut flour you use to create that traditional pancake consistency. So don’t leave out the bananas! 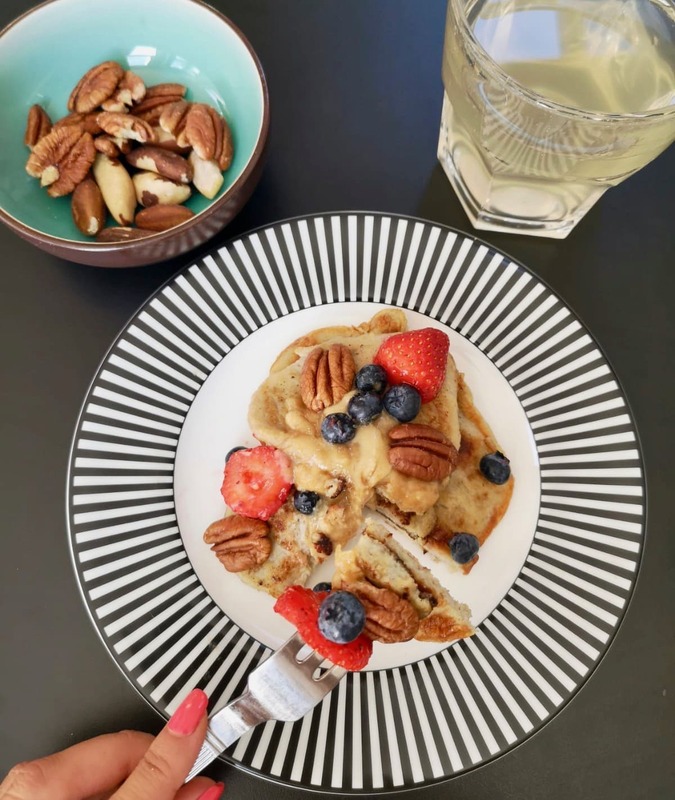 The best thing about these delicious banana pancakes is this: they’ll give you all of that pancake goodness you love with none of the bloated, over-stuffed after-feeling of heavy, syrup-soaked traditional pancakes! Makes enough for 2 or tomorrows breakfast/afternoon snack/seconds? Heat a small frying pan (preferably non-stick) on a medium to low heat and spoon 1/2 a tsp of coconut oil until melted. Cover the pan fully. 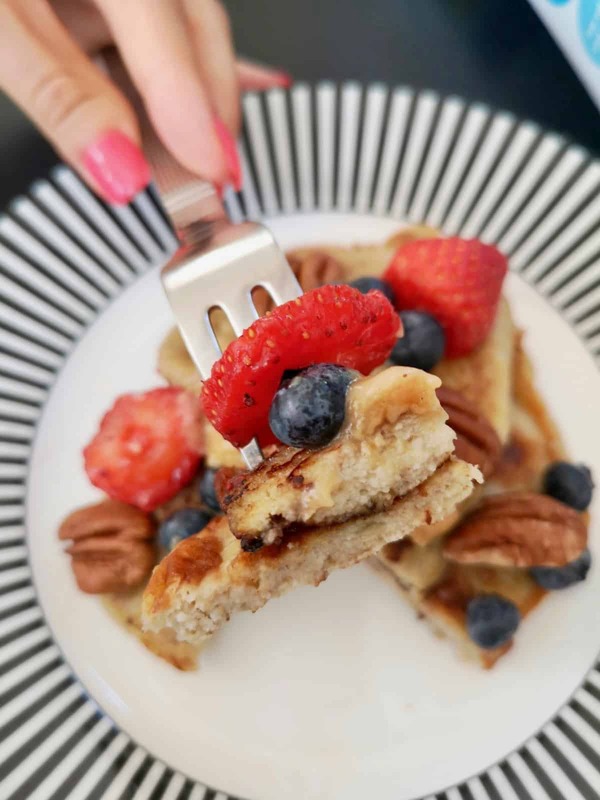 Transfer the pancake to a plate and repeat with the rest of the fuffy goodies! Serve however you like, with whatever you fancy on the morning. I like to top mine with mixed berries, peanut butter and chopped nuts for some added crunch. I also like a sprinkle of desiccated coconut. Team with a glass of coconut water to keep the tropical coconutty trend going (I’ve gone with Vita Coco original coconut water with mine this morning and a side of brazils).